The African spurred tortoise (Geochelone sulcata), also called the African spur thigh tortoise or the sulcata tortoise, is a species of tortoise which inhabits the southern edge of the Sahara desert, in northern Africa. It is the third largest species of tortoise in the world and the largest species of mainland tortoise (not found on an island). Its generic name is a combination of two Greek words:Geo(γαια) meaning "earth" or "land" and Chelone(Χελωνη) meaning "tortoise". 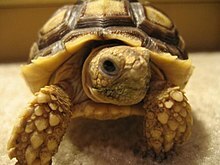 Its specific name sulcata is from the Latin word sulcus meaning "furrow" and refers to the furrows on the tortoise's scales. The African spurred tortoise is native to the Sahara Desert and the Sahel, a transitional ecoregion of semi-arid grasslands, savannas, and thorn shrublands found in the countries of Burkina Faso, Chad, Eritrea, Ethiopia, Mali, Mauritania, Nigeria, Senegal and Sudan In these arid regions the tortoise excavates burrows in the ground to get to areas with higher moisture levels spending the hottest part of the day in these burrows. Burrows may average 30 inches in depth; some dig tunnel systems extending 10 feet or more underground. The Sulcata is the third largest species of tortoise in the world after the Galapagos tortoise, and Aldabra Giant Tortoise; and the largest of the mainland tortoises. Adults are usually 18 inches (45 cm) in shell length, and weigh 70 to 100 pounds. Specimens with 24 to 36 inch long (60-90 cm) shells weighing 150 pounds (70 kg) are not unknown. They grow from hatchling size (2-3 inches) very quickly, reaching 6-10 inches (15-25 cm) within the first few years of their lives. The lifespan of an African Spurred Tortoise is about 30-50 years (The oldest in record is 54 years, located in the Giza Zoological Gardens, Egypt, 1986). This is not to be confused with the lifespan of the phonetically similar Spur-Thighed tortoise from Europe, the oldest known record being 165 years. Copulation takes place right after the rainy season, during the months from September through November. Males combat each other for breeding rights with the females and are vocal during copulation. Sixty days after mating, the female begins to roam looking for suitable nesting sites. For five to fifteen days, four or five nests may be excavated before she selects the perfect location in which the eggs will be laid. Loose dirt is kicked out of the depression, and the female may frequently urinate into the depression. Once it reaches approximately 2 feet (60 cm) in diameter and approximately 3-6 inches (7-14 cm) deep, a further depression, measuring some eight inches (20 cm) across and in depth, will be dug out towards the back of the original depression. The work of digging the nest may take up to five hours; the speed with which it is dug seems to be dependent upon the relative hardness of the ground. It usually..